Mrs. Paulina Morales was one of the most wanted guerillas by the Japanese Army occupying the Philippines during World War II, with the highest price on her head if captured or killed. We don’t know why, but it wasn’t for her cooking skills. She knew knives, and must have been fierce and relentless. Paulina and Clemente Morales, Sr. got married and left the Philippines for work at the Royal Hawaiian Hotel. The year was 1926. Calvin Coolidge was President, and the wounds of World War I were still healing. Later they moved to Paso Robles, California to work as a busboy and maid. Clem Sr., though, had studied accounting in college in the Philippines, got promoted, and eventually became a successful labor contractor with a camp in Chualar, near Salinas. 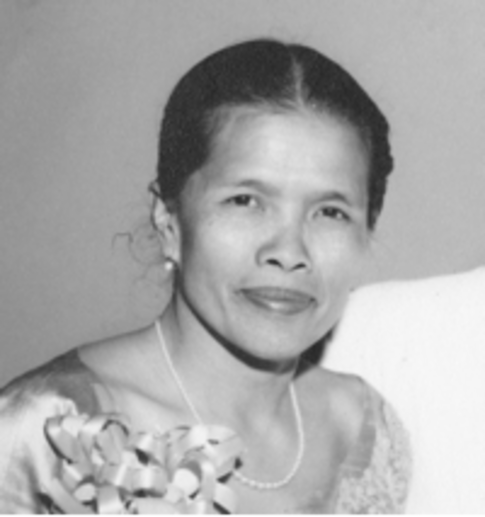 Fifty to eighty Filipino immigrants lived in the camp and Paulina Morales cooked for all of them. Later the camp moved to a farmhouse right on the ranch, where Clem drove the car into a ditch while learning to drive, and got it out with a tractor he already knew how to handle. Mom went to Salinas to have her baby, and Clem Jr. was born on Dr. Jose Rizal Day, December 30, 1931. Dr. Rizal is the most distinguished, accomplished, and famous of the Philippines’ political heroes, and he was executed on December 30, 1896 by the Spanish for pursuing independence from Spain and dignity for all Philippine citizens. Clem and his family later had a dry cleaning business in Chinatown, across the street from a photographer. Hoping to gain the patronage of her countrymen, Mrs. Paulina Morales, charming wife of a prominent contactor here, opened Saturday her dry cleaning establishment under the name of MANILA CLEANERS, 104 Lake Street. Mrs. Morales said that she will fully equip her establishment to meet all requirements of a dry cleaning business. Before the grand opening she made it understood that service and reasonable prices will be her watchword. The business will be under the direct supervision of Mrs. Morales, who is certain she can invite the patronage of the big and little camps in Salinas Valley. When Clem was a child, he and his Mom went to visit family and friends in Hong Kong, with plans to buy some land and start a business. The plan was to stay there until Clem was ready to go to Salinas High School. The Japanese cruise ship stopped in Hawaii, Kobe, and Tokyo—where they stayed at the Imperial palace Hotel—before going on to the Philippines. They established a plantation growing abaca and other fiber crops in the Kidapawaan part of Mindanao in the southern part of the Philippines. Before her sailing, MRS. MORALES expressed her regret she could not see the Colmo del Rodeo pageantry in which a Filipino float was entered. She devoted much of her time in helping the community raise the fund necessary for making of the artistic float. On July 18, a farewell party was tendered in her honor by members of the Shangri-La. This party was initiated by Mr. And Mrs. M. R. Galicia. Songs and speeches featured the after-dinner program held under the shady trees. Val Arellano acted as the impromptu toastmaster and called on the following: Frances La Verne sang "[You Are My] Sunshine," little Lily Malvas sang that Kundiman "Pacing." Helen Filomero gave another vocal solo, and the speeches of Mrs. B. R. Sampayan, and Mr. Galicia who all wished MRS. MORALES and her son a bon voyage. The year was 1940. A little over a year later the Japanese attacked Pearl Harbor, and ten hours later the Philippines. No more boats left the Philippines for the United States. Clem and his Mom were separated and stranded. Paulina joined the guerillas in Mindanao, an area that the Spanish, Japanese, Americans, and the current independent Philippines governments have never conquered. Clem was sent by oxcart to relatives in the northern provinces around Llocos Norte. They enrolled him at boarding school in the walled city of Intramuros. Clem would have no communication with his mother or father for almost six years. Clem witnessed the Bataan Death March as a child when it passed near Manila. The Japanese soldiers warned the children, “Don’t give anything to them; don’t talk to them.” Clem was twelve to thirteen years old; his mother was maybe alive, maybe dead; and his Dad was worried sick 7,500 miles away. Among the American prisoners on the Death March were ninety-nine soldiers from Company C, 194th Tank Battalion of the Salinas and Pajaro Valleys. Fifty perished on the death march and subsequent events. Among the survivors was Frank Muther, a dairy farmer. He remembered both the cruelty, and the surreptitious sharing of food by some of the guards. Not a bitter man, when the Japanese Americans returned to the Salinas area John Muther was very supportive, and helped them out in a variety of ways. Life wasn’t bad for Clem at the boarding school or with his relatives during the war. He went barefoot and wore a T-shirt, and went fishing a lot. The Japanese never asked whether he was American. In his new hometown they were required to bow to the Japanese guards. It was a small town, only about fifteen soldiers, but the Japanese guards ran it with an iron hand. The school became Japanese, and he learned in Japanese. In his recent oral history, Clem sang the Japanese National Anthem they were required to sing seventy-one years ago at the school. Getting slapped around for saying the wrong thing was commonplace. He also saw a few beheadings, including one of a relative. Following the bombing of Pearl Harbor and invasion of the Philippines, the1st Filipino Regiment began forming in March 1942, and was seven thousand men strong by May. The 2nd Regiment formed in November of 1942 at Fort Ord. They mustered across the fence from the “Assembly Center” [prison] where their Japanese American friends and neighbors were being held before being shipped to the internment camps starting in May 1942. Some of the Filipino soldiers were married to Japanese women who, along with their children, were assembled and then sent to internment camps. General MacArthur immediately started selecting soldiers from the regiments for guerilla and covert work throughout the Pacific Theatre, especially in the Philippines. Some were sent to join the Alamo Scouts, or the 5217th Recon Battalion (Sixth U.S. Army). The Filipino Americans assigned to the various Special Operations teams in the Pacific contributed to the eventual formation of Special Operations as we know it today, such as the Seal Team 6 that got Osama Bin Laden. After 5 years—an eternity for boy turning teenager—Clem saw American planes in the sky, and soon the Philippine Civil Affairs Units Teams 1–8 joined the forces led by General MacArthur in his invasion of the northern part of the Philippines. One of the soldiers found Clem and gave him a note from his Dad. It was his first contact in six years with either parent, and his voice still cracks with emotion when he tells the story. He had just started high school. While we don’t know what Paulina Morales, Clem’s Mom, did in combat, we do know that after the war was over General Selapiba Pendatum, soon to be Governor of Mindanao after Independence, arranged for a Mustang fighter plane to take her to see Clem, and then a week later for a C47 to pick him up. Clem remembers being given a Coca-Cola that tasted real, real good. I take these words of General Douglas MacArthur shortly after his triumphant return to the Philippines as representative of what Paulina Morales might have done. As our forces of liberation roll forward the splendid aid we are receiving from guerrilla units throughout the immediate objective area and adjacent islands causes me at this time to pay public tribute to those great patriots both Filipino and American who had led and supported the resistance movement in the Philippines since the dark days of 1942. These inadequately armed patriots have fought the enemy for more than two years. Most are Filipinos but among these are a number of Americans who never surrendered, who escaped from prison camps, or who were sent in to carry out specific missions. Following the disaster which, in the face of overwhelming superior enemy power, overtook our gallant forces, a deep and impenetrable silence engulfed the Philippines. Through that silence no news concerning the fate of the Filipino people reached the outside world until broken by a weak signal from a radio set on the Island of Panay which was picked up, in the late fall of that same fateful year, by listening posts of the War Department and flashed to my Headquarters. That signal, weak and short as it was, lifted the curtain of silence and uncertainty and disclosed the start of a human drama with few parallels in military history. In it I recognized the spontaneous movement of the Filipino people to resist the shackles with which the enemy sought to bind them both physically and spiritually. I saw a people in one of the most tragic hours of human history, bereft of all reason for hope and without material support, endeavoring, despite the stern realities confronting them, to hold aloft the flaming torch of liberty. I gave this movement all spiritual and material support that my limited resources would permit. Through the understanding assistance of our Navy I was able to send in by submarine, in driblets at first, arms, ammunition and medical supplies. News of the first such shipment spread rapidly throughout the Philippines to electrify the people into full returning consciousness that Americans had neither abandoned them nor forgotten them. Since then, as resources increased, I was enabled, after formalizing the guerrilla forces by their recognition and incorporation as units of our Army, to send vitally needed supplies in ever increasing quantities through Philippine coastal contacts by four submarines finally committed exclusively to that purpose. I would that at this time I might name the gallant heroes of this epic in Philippine-American history, but considerations of security for the individuals, their families and the cause require that I limit myself to a generalization of their work and a statement of their brilliant achievements. Of the latter I need but point out that for the purposes of this campaign we are materially aided by strong, battle tested forces in nearly every Philippine community, alerted to strike violent blows against the enemy's rear as our lines of battle move forward and that now are providing countless large areas adjacent to military objectives into which our airmen may drop with assurance of immediate rescue and protection. We are aided by the militant loyalty of a whole people—a people who have rallied as one behind the standards of those stalwart patriots who, reduced to wretched material conditions yet sustained by an unconquerable spirit, have formed an invincible center to a resolute over-all resistance. We are aided by the fact that for many months our plans of campaign have benefited from the hazardous labor of a vast network of agents numbering into the hundreds of thousands providing precise, accurate and detailed information on major enemy moves and installations throughout the Philippine Archipelago. We are aided by the fact that through a vast network of radio positions extending into every center of enemy activity and concentration throughout the islands, I have been kept in immediate and constant communication with such widespread sources of information. We are aided by the fact that on every major island of the Philippines there are one or more completely equipped and staffed weather observatories which flash to my Headquarters full weather data morning, afternoon and night of every day and which in turn provides the basis for reliable weather forecasts to facilitate and secure the implementation of our operational plans. Widely disseminated to our forces throughout the Pacific and in China the information from this weather system has materially aided our military operations over a large section of the world's surface. We are aided by an air warning system affording visual observation of the air over nearly every square foot of Philippine soil established for the purpose of flashing immediate warning of enemy aircraft movement through that same vast network of radio communications. We are aided by provision of all inland waterways and coastal areas of complete observation over enemy naval movement to give immediate target information to our submarines on patrol in or near Philippine waters. This information has contributed to the sinking of enemy shipping of enormous tonnage, and through such same facilities was flashed the warning to our naval forces of the enemy naval concentration off the western Philippines during the Marianas operation. Finally we are aided by the interior vigilance that has secured for our military use countless enemy documents of great value, among which were the secret defensive plans and instructions of the Commander-in-Chief of the combined Japanese areas and complete information on the strength and dispositions of enemy fleet and naval air units. That same Commander-in-Chief of the Combined Japanese Fleets was a prisoner of one of our guerrilla units prior to his death from injuries sustained in an air crash. All of these vital aids to our military operations, and there are many more still unmentioned, are responsive to the indomitable courage of the military and civil leaders whom I shall in future name and their loyal followers both Filipino and American; to gallant Filipinos, residents of the United States, who have volunteered to infiltrate into the islands in succor of their countrymen and Americans who have infiltrated with them; and finally to the militant loyalty and unconquerable spirit of the masses of the Filipino people. As Commander-in-Chief of the forces of liberation I publicly acknowledge and pay tribute to the great spiritual power that has made possible these notable and glorious achievements—achievements which find few counterparts in military history. Those great patriots, Filipino and American, both living and dead, upon whose valiant shoulders has rested the leadership and responsibility for the indomitable movement in the past critical period, shall, when their identities can be known, find a lasting place on the scroll of heroes of both nations-heroes who have selflessly and defiantly subordinated all to the cause of human liberty. Their names and their deeds shall ever be enshrined in the hearts of our two peoples in whose darkest hours they have waged relentless war against the forces of evil that sought, through ruthless brutality, the enslavement of the Filipino people. To those great patriots to whom I now pay public tribute I say stand to your battle stations and relax not your vigilance until our forces shall have swept forward to relieve you. All of these articles from The Filipino American Experience Research Project © October 3, 1998. From the archives of Alex Fabros. Paulina Morales was decorated by General Pendatum and given a ceremonial sword that Clem still has. It took about six months to get all necessary papers and arrange transportation back to the United States on a military transport. Clem shined shoes, made a little money, and drank a lot of Coke. The children being transported travelled with the navy nurses, but Clem was too old, so he became the only kid bunking with these battle-hardened GI’s who were finally going home. He loved it. SALINAS—MRS. PAULINA MORALES, former dynamic president of the Filipino Women’s Club of Salinas Valley and wife of CLEMENTE MORALES, Sr., popular contractor, returned to this city with her son, Clemente Jr., after almost six years in the Philippines. MRS. MORALES and her son went back to the Philippines in July, 1940. While in the Philippines, she went to Cotobato, Mindanao, where she was interested in the abaca industry. Because of her enthusiasm of this particular industry plus her interest in the promising new Ramie crop, raw materials for rayon silk, MRS. MORALES bought a homestead where she built a modern house, patterned to an American home. Before the war Clemente, Jr., was studying in Manila while his mother was supervising her homestead in Cotobato. When the war broke out in the islands, the mother and son were separated. MRS. MORALES implies that as a mother, she never lost any hope of meeting sooner or later Junior, although she stayed in the evacuation camp in Cotobato from May 5, 1942 until May 15, 1945 when the 116th Regiment, U. S. Army, liberated the camp. The authorities of the Military government saw in MRS. MORALES a leadership, one that could be depended upon. As such she was offered the post of a Mayor, but she refused because she was more concerned about her son than personal glory. MRS. MORALES took a plane to Laonag, Iloscos Norte, where she proceeded to her home town, Salsons. There she met her son in the company of her father-in-law, MRS. MORALES said that she wanted to join her husband here with her son. "That is why we are here again, in this prosperous town," she remarked. Salinas Community Honors Filipino Veterans With A Banquet And Ball: MRS. PAULINA MORALES who just arrived from the Philippines tells audience of urgent need of the Filipino people for clothes. SALINAS—With Atty. Anthony Brazil, District Attorney of Monterey County, as guest speaker, the Filipino Community of Salinas Valley tendered a banquet and ball in honor of the Filipino veterans at the Army Hall on March 30th. There were about 400 guests at the affair. Mr. Brazil declared that justice is for everybody regardless of race, color and religion. He paid tribute to the veterans of this war and those who gave their lives so that others may live in the way they want to be. After a delicious dinner was served, a very entertaining program followed of which Pantaleon Espejo, vice president, served as the master of ceremonies. Rev. Robert Crichton gave the invocation. Dolores Catalla, violinist and a high school student, captured the heart of her audience with her sweet voice when she gave a vocal solo. Miss Pacita Tod also received a tremendous applause when she gave a vocal solo, accompanied at the piano by Madame Turgue. Manuel Luz, president, gave a remark emphasizing the need of cooperation. Mrs. Estela Sulit of San Francisco gave a speech exalting the deed of the Filipino veterans. MRS. PAULINA MORALES who just arrived from the Philippines also made a speech emphasizing the urgent need of the Filipino people for clothes. After the program, a scroll of honor was given to each veteran by the Filipino community. Misses Gloria Abarquez and Gertrude Baguio handed the scrolls to the veterans. The rest of the evening was spent in dancing. Clem and his Mom returned to Salinas. Clem started at Salinas High School, and despite being the smallest kid on the team at four feet ten inches, they won the championship every year he was there. He picked lettuce in the summer with the Mexican laborers. Mom was still the cook, and served a hot breakfast early before work, and a hot lunch to everyone, every day in the fields. Clem enjoyed the Philippine Traditional Folk Dancing ensemble and dance bands Paulina organized with Herb Miller. He was on two floats, one with a biplane on it, that were part of the Rodeo. He wore a cowboy outfit. Clem joined the U.S. Air Force to fight the Korean War, but ended up stationed in Hawaii. He came back to Salinas in 1954 to join the family produce business, but not too much later got the job at the Salinas Valley Bowl that lead to his career with Saudi Arabian Airlines. While with Saudi Arabian Airlines, he’d go once a month to Hong Kong to buy music and music equipment. He bought vintage Macintosh and the first CD player—the CDX101. There were only two CDs available at the time—the Beatles and Elvis Presley. Clem managed a facility in Dahran, Saudi Arabia and was there during the first Gulf War. He had people from Thailand, Pakistan, the Philippines, Korea, Britain, and Saudi Arabia working for him. He saw many beheadings under Sharia law. People were forced to witness these events to improve their deterrent value. He thought them more humane than those he witnessed in World War II because the prisoners were drugged before the executioner’s sword fell. Clem says, “She’s a hero…To think I was involved with her…” Clem was seventy-eight when interviewed for the California State University Monterey Bay oral history program. Paulina was in her sixties when she passed away.